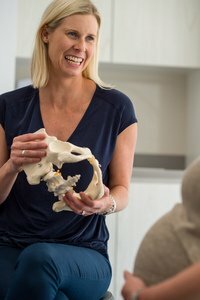 Pelvic Girdle Pain – What is PGP? As many as 50% of women experience PGP during pregnancy. Happily, 90% of women recover from PGP within 12 months of having their baby. However, up to 10% of women can continue to have significant PGP and disability 2 years post-birth. PGP refers to pain felt either in the back of the pelvis, on one or both sides and/or pain over the pubic joint. Pain in generally located between the top of the pelvis and the bottom of the buttocks. Pain may be referred into the buttock and/or down the leg, so it’s often confused with sciatica. PGP involving the pubic symphysis joint can also refer pain to the groin, inner thigh, lower abdomen and vaginal area. PGP is a condition often misdiagnosed, misunderstood and poorly managed. What causes PGP during pregnancy and after having a baby? Less obvious are the hormonal changes that occur, right from the first trimester, which changes the ‘stretchiness’ of your ligaments. Relaxin is one of the hormones responsible for this increase in ligament laxity, as it changes the collagen structure of your connective tissue (which makes up ligaments). Connective tissue, including ligaments, helps control your joints and support your pelvic floor muscles. Joints rely on your muscles to control their movement, helped by the ligaments around the joint. They have a good ‘job-sharing’ arrangement to allow work done by each component to give good movement control around the joint. When you become pregnant, the ligaments become stretchy, and the muscles need to work a little harder to maintain good control of the joints. The joints of the pelvis have very little, almost imperceptible movement in them when you are not pregnant. When you are pregnant this movement increases and although extremely small, it can be double the movement that was present prior to pregnancy. If the muscles are doing their job properly, then they work a little harder and good movement control is maintained. However, it is very common in pregnancy for the muscles not to recognise the need to change the way they work. This leads to poor control of the extra movement available to the joints, stressing the ligaments and resulting in inflammation and pain. It is very similar to walking over very rocky, uneven ground, with your ankles rolling more than they usually do, pulling on your ankle ligaments – this would result in inflamed and sore ankle ligaments. If you have PGP, when you have been walking around your pelvic joints may be sore, as they have experienced the same kind of stress. The joints of the pelvis transfer the load of our body weight from our legs to our trunk, and then to the other leg as we walk around. Higher loads, such as carrying a weight (toddler, shopping) or jogging/running significantly increases the difficulty for your joints to do this load transfer wit good control. As we have already discussed, poor control generally results in pain! As your tummy muscles stretch throughout pregnancy, and the weight of the baby increases on your pelvic floor muscles, it is harder for the muscles to tighten and support the pelvic joints, and this too can contribute to poor control of the pelvic joint movement, and increased pain. Initially you may need to stop exercising while your pain settles, but it is important that you re-commence exercising as recommended by your physiotherapist. Doing no exercise is as bad as doing the wrong exercise when you have PGP. You become deconditioned, and the muscles you need to help control your pelvic joints are less able to work for you. When your pgp is bad, walking is often not the best exercise. Swimming, exercise bike, and specific physio run pregnancy exercise classes are all ways for you to be able to maintain your cardiovascular fitness during pregnancy, and in the post natal period if you have PGP. 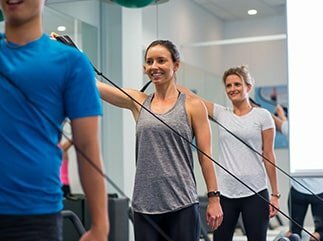 We specifically recommend physio classes during this time, as the physio will be able to modify the class for you if there are exercises in the class that are not PGP “friendly”. 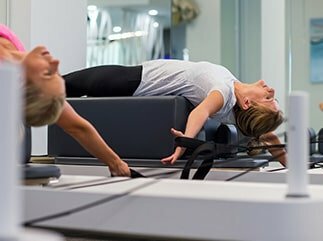 Clinical Pilates is a method of exercising that targets your deep postural muscles, training them to work better to control your lumbar spine and pelvic joints. This is treating “the cause” rather than just treating the symptoms of PGP. Clinical Pilates is individually prescribed exercises, after a full assessment, by a physiotherapist with Clinical Pilates training. It is not a generic Pilates class where everyone does the same exercises and highly recommended for those with PGP. Pregnant and with back pain?? You don’t need to suffer. We can help settle the inflammation and gain back some control of your pelvis.